In I had just finished turning on the heater in my shop to warm it up so I could start shaping and polishing some beads from the bag of Carico Lake nuggets beside me when the phone rang. I picked up the phone and heard someone say hello that they were one of the Edgars and wanted to know if I would be interested in some turquoise cabs that they had put away for a number of years. 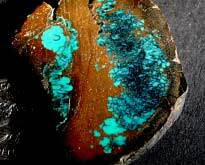 Well anyone who has read much on the history of Nevada turquoise know that the Edgars’ were at one time the premier turquoise mining family and any turquoise mines worth mining had been owned by members of the Edgar family. So I was getting pretty excited and began by asking when and where we could meet. This Edgar had owned the Blue Wind mine and had also worked the Thunder Mountain mine and a few others. He had lived at the Super X when he was young and worked that mine in the summers. After agreeing to a time to meet I packed a bag and headed off once again into Nevada. I was really looking forward to this trip. Now that I’m the present owner of the Blue Wind mine I thought this meeting might give me a chance to learn something about the history of the mine. 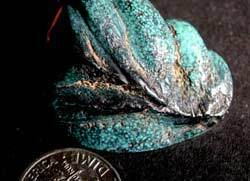 Since it had been found after 1970 very little had been written about the Blue Wind even thought it produces some of the most beautiful black webbed turquoise to come out of Nevada. 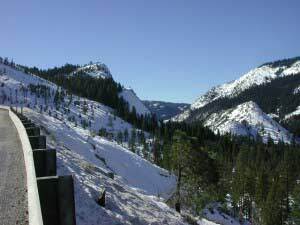 It’s always a cold drive into northern Nevada in the winter. Not as much snow as usual but still cold and icy. I arrived at our meeting and immediately starting asking questions about the Blue Wind and the early material that was found. 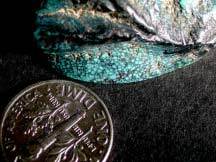 The early workings of the mine only produced about 100 pounds of turquoise before it played out, another one of Nevada’s turquoise ‘Hat’ mines. The Blue Wind name came from the windy black swirls that were seen blowing through the stone. The Blue Wind ring below is a great example. 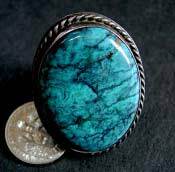 The surprise of the day was a rare Blue Wind ‘fossil’ turquoise shell that Edgar had keep for over 30 years. The only one found at the mine. He had made a gold pendant with the fossil shell and had given it to his young daughter. After a few hours of convincing her that her college education may be worth more than the fossil I had the rare piece of turquoise in my pocket and was on my way home.